This was written while I spent a lonely fourth of July in the Marriott Hotel in Jeddah, Saudi Arabia, in the summer 1997. After many years of pushing airplanes about the sky, I have been recollecting about how I got hooked on aviation way back in 1942. My childhood will always be World War II. It still remains very immediate to my older sisters and me, even though it is now more than half a century since it ended. In those days we lived in a little village among the scrub oak woods and potato fields on the north shore of eastern Long Island. During that first war summer, if it was not raining, we usually spent our afternoons at a Beach Club on Long Island Sound where my Mother believed we children could not get into trouble. One exciting day the Beach Club had a soldier patrolling the shore. He had strap-on leggings, a flat tin helmet and a World War I vintage rifle, which he was not averse to showing to interested children. He seemed very young, and not fierce enough to protect our stretch of beach if the Germans should come swarming ashore. Later in the summer other soldiers who patrolled the beach (they were changed periodically) seemed equally young and homesick. Our little village had several practice black outs. I recall that our household failed all of them. There was also rationing, which seemed to worry the grown-ups more than us. My mother, maybe to make up for the black outs, joined the Beach Club wives in a Voluntary Motor Auxiliary to help when the invasion started. Mr. O'Berry, who owned the gas station, taught the wives how to change flat tires. To the best of my knowledge, Mother rapidly forgot this skill and subsequently never practiced it. Fortunately the Germans never invaded Long Island so the Motor Auxiliary's services were not required. Since most of the fathers in our village had gone off to fight, our mothers and grandparents became serious radio-news listeners. Though the news was not good, all the grown-ups assured us that America and her friends would win the war. Naturally we children were somewhat skeptical, considering the boy soldiers, the black outs and the Motor Auxiliary. However, there was one non-verbal statement about America which occurred many afternoons that first summer of the war, and which gave us some hope for the grown-ups veracity. In the mid-afternoon, as we played at the Beach Club, there often would be a distant buzz way east of the Big Rock. Then a speck would appear below the cliffs. The speck would become rounder with stubby wings as it moved ever faster over the beach toward us. The sound built rapidly to a high pitch. Very soon we could make out the head of the pilot in the cockpit and even the rivets on the little, rotund, propeller airplane just off shore and barely 20 feet above the water. As it passed abeam of us, it would rock its wings and pull up into a thirty-degree climb. We would see the two black, doughnut-shaped wheels tucked into the fuselage. Then the airplane would level out and shrink once more into a speck against the sky as it flew off towards the factory at Bethpage. Most of the boys would say "Wildcat! ", while the mothers would remark, "There goes Gil Greenway," referring to a 4F neighbor, by default a Grumman test pilot. The Wildcats were at best small statements, but they made us proud and hopeful. As the summer wore on, the radio news remained discouraging. Europe seemed to be gone, with the English fallen back to their island. In the Pacific we had lost the Philippines and Wake Island. Bataan and Corregidor were not considered good subjects for American children. German submarines lurked in numbers off our coast and flotsam from torpedoed ships occasionally washed in on the high tide. Then the news started to get better. The fat little Wildcats from Long Island seemed to be holding their own against the Mitsubishi Zeros. Our Navy actually turned back the Japanese fleet in the Central Pacific and the Aleutians. The wonderful thing that happened for me occurred towards the end of that summer. Like most afternoons, we were at the Beach Club when I heard a new, much deeper noise from way east of the Big Rock. The speck appeared in the usual place below the cliffs, but it seemed different and less rotund as it came hurtling low over the beach towards us. A strange, big fighter with a light gray underside flashed by abeam us, and with a great roar pulled up into a 45ƒ climb. Then the fighter incredibly continued its steep climb until it disappeared into the summer cumulus and sea mist. Everyone for once was silent until I shouted, "Hellcat!" Well, we did, of course, eventually win the war. 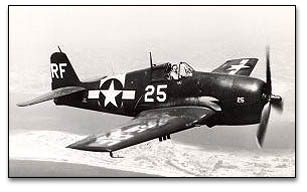 The Hellcats from Bethpage, Long Island contributed by shooting down more enemy planes than did any other type of American fighter. Like my own father, many Hellcats were lost in the Pacific War. In fact very few of these wonderful airplanes survive today. Now I also have retired from a long and happy career as an airline pilot. My mounts of the last 20-some years have been sleek jet transports. But in my head still remains the sound of a Pratt and Whitney deep-throated roar as Mr. Greenway eases back on the stick and sends his Hellcat into that long-ago summer sky. I occasionally get to visit my family on Long Island. They live in the same village, though it is much bigger and more suburban than rural. The scrub oaks are fewer and the potato fields are gone. However, the Beach Club still exists, quite unchanged. When I visit it, I look way east of the Big Rock and listen.